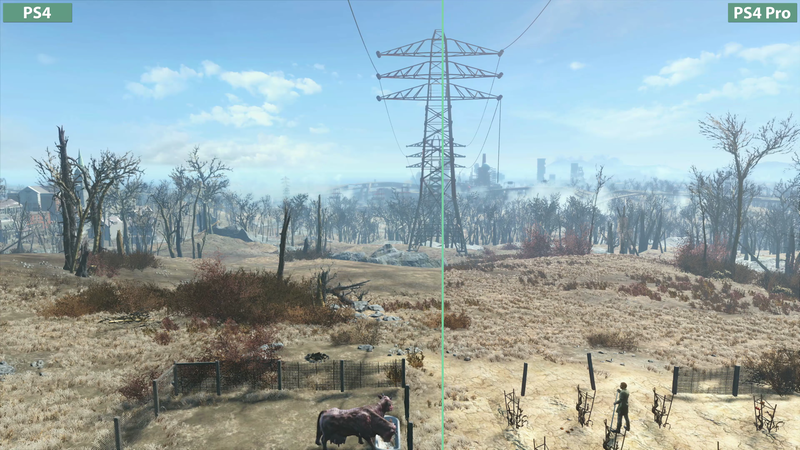 The PS4 Pro patched version of Fallout 4 gives players much more grass. The PlayStation 4 Pro support patch for Fallout 4 arrived this week, delivering 1440p resolution, increased draw distances and enhanced Godray effects. YouTube’s Candyland created a video demonstrating the small but significant enhancements players can expect from the patch. While the enhanced resolution is an obvious benefit, things like draw distance and enhanced Godray effects are a bit more subtle. Take the screenshot above. On the left, the plain PlayStation 4 version, which looks just fine, until you see the game running with the Pro patch. The grass and bushes that would otherwise pop in as you travel are in full effect on the left, adding to the relatively realism and depth of the scene. It’s not just the grass, but texture details in general that benefit from draw distance. Check out the ragged edges of the roof in the picture above. As for Godrays, these are shafts of light coming from the sun, peeking through clouds and other objects. The actual term for them is crepuscular rays, but Godrays sounds much cooler. The changes here are a bit more nuanced, but the Candyland folks found an excellent example. The PS4 Pro patch version’s Godrays are much sharper than the regular version, with a slight flicker that distorts the lines of the object they’re peeking through. The Fallout 4 PlayStation 4 Pro patch is indicative of the sorts of subtle changes patched games receive on Sony’s enhanced console, outside of obvious resolution and frame rate enhancements. It’s the little things. Check out Candyland’s full video below for more examples.